This week marks the 20th anniversary of the worst genocide in Europe since the Second World War. The death toll in Srebrenica was more than 8,000 Bosniak men and boys, gunned down by the Bosnian Serbs under the generalship of Ratko Mladic, who remains on trial at the International Criminal Tribunal for the former Yugoslavia for crimes against humanity, including the events at Srebrenica. I have been fascinated and disturbed by the genocide at Srebrenica since my childhood. 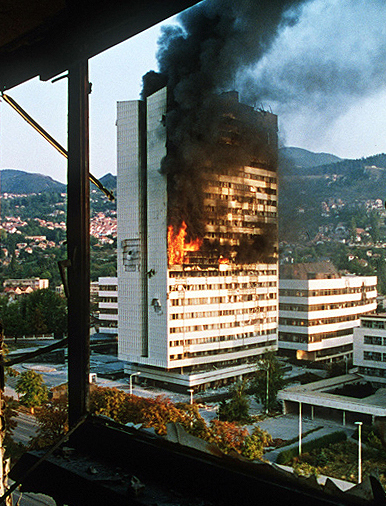 One of my earliest memories is watching news footage of the Bosnian war and the Siege of Sarajevo; I have a vivid memory of the smoke and flames billowing from the Parliament building, and the distinctive yellow block of the Holiday Inn, where most of the foreign media were based during the war. Srebrenica has special resonance for me partly because of a song written by the American folk singer, Tom Paxton. We used to listen to Tom Paxton a lot when I was a child, and many of his songs were cutesy throwaways: zany treats like “Goin’ to the Zoo” and funny little vignettes such as “I Don’t Want a Bunny Wunny“, a musing upon President Jimmy Carter’s encounter with a vicious killer rabbit. On the Road from Srebrenica, though, is Paxton at his most visceral, serious and human; a mournful retelling of the brutal violence meted out, through a series of disturbing images. The lyrics zoom in and out from individuals among the panicked thousands fleeing; they dwell on the sickening efficacy of the murder; they provide that mixture of awful dread and just enough humanity (in the carefully hopeful third verse) to sock you in the gut every time you listen to it. Ok, it has some poetic licence: Paxton seems obsessed with the idea that the weather was cold, even though the massacre occurred in July, and Eastern European countries including Bosnia are generally very warm at that time of year. But the essential truth of the song can’t be denied. It is a fitting memorial for one of the greatest blots on human history. It still astonishes me that this occurred in my lifetime.